Arhatic Yoga is the spiritual path for Pranic Healers. Arhatic Yoga is a synthesis of various yogic techniques, including powerful meditations and energy-generating physical and breathing exercises, integrated into a step-by-step system that rapidly and safely accelerates the spiritual development of the practitioner. Arhatic derives from the word Arhat, which means a perfected one, or a highly evolved being. An Arhat is one who, through diligent practice of yogic techniques and purposeful character-building, has overcome the impurities of desire and will. An Arhat has well developed intuition, advanced mental powers, highly refined emotions and a strong desire to contribute personally to the uplifting of humanity. 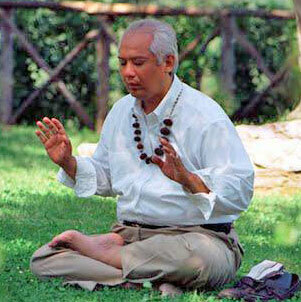 Grand Master Choa Kok Sui, the Chinese-Filipino spiritual master who is also the modern founder of Pranic Healing, created Arhatic Yoga to enable people of various formal religious beliefs or philosophies, to have access to inner teachings that make it easier for them to pursue spiritual development while at the same time maintaining a normal life. This means that in Arhatic Yoga, the individual who wishes to pursue the spiritual path need not retreat from the world, their career or their current relationships. In fact, these pursuits are used to help the individual to further develop, through the daily challenges and interactions, as well as difficulties that may occur within the family, in the office, or in the contemporary lifestyle. Arhatic Yoga has been specifically designed to allow the practitioner to maintain their initial religious or philosophic practice. Practitioners may even improve or become more dedicated to their faith through this system of personal and spiritual development. Arhatic Yoga is further distinguished by its multi-leveled approach and its focus on purification, character-building and service. All Arhatic Yoga practitioners begin at the Preparatory Level, where they learn the basics of spiritual development, as well as the fundamental meditations and breathing exercises, or pranayama, that get their physical and energy bodies ready for the great amount of energy that their practice will generate at the higher levels of Arhatic. But first, they must build a clean and strong energetic base at the Preparatory Level. Purification is a critical element of the Arhatic Yoga practitioner’s foundation. Through physical and breathing exercises, the implementation of simple dietary guidelines, and greater control of their emotions, practitioners develop stronger and more vibrant, energetically clean physical and energy bodies. These purification routines yield significant benefits, including the ability to recognize and help avoid negative or unhealthy energies, to maintain healthier physical bodies and to help avoid Kundalini syndrome. Kundalini is the innate energy that resides near the base of the spine. When stimulated, this Energy can be used to accelerate spiritual development. However, when this energy is activated spontaneously or without proper guidance or direction, it can produce a host of unpleasant physical and emotional symptoms, and may even cause financial or material reversals. Arhatic Yoga‘s emphasis on purification greatly minimizes the risk of kundalini syndrome. Meditation, along with physical and breathing exercises, increases the size of the chakras, or energy centers, but it is character-building that keeps them large and powerful. In addition, Arhatic Yogis become increasingly more dedicated to Serving and uplifting humanity, more Balanced, much calmer and better equipped to deal with the stresses of our modern lifestyle. The increased interest in Service accelerates their Good Karma, leading them to experience greater success, happier relationships and a healthier perspective on life. In the Higher Arhatic levels of advancement, more Advanced Yogic Practices are shared. You may learn detailed information about the development of the Golden Body, about how to develop your intuitive facility and how to achieve Oneness, or Samadhi with your Higher Soul, leading you along the path to greater Illumination. If you are relatively healthy, can follow simple instructions and can stick to a regular routine, Arhatic Yoga may be of interest to you. Arhatic Yoga teaches a moderate approach to Spirituality and considers the worldly needs as well as the spiritual needs of the practitioners.